Mark Anthony Miller is a Brooklyn street artist, known as CAM, whose works can be seen in Brooklyn’s DUMBO neighborhood. His work is often inspired by stained glasses, as could be seen last year in the Always be Mindful of your Ability to Fly exhibition at the DUMBO Art Festival. 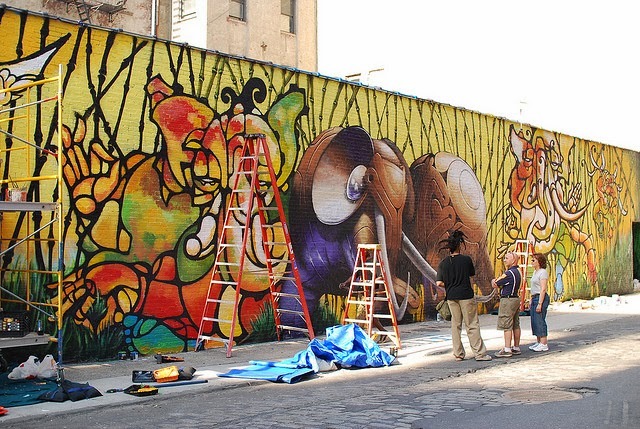 On January 21, he filed a complaint in the Eastern District Court of New York for copyright infringement against Toll Brothers, Inc., a real estate development company, claiming that Defendant used without permission a reproduction of one of his works, a mural in DUMBO now destroyed. The case is Craig Anthony Miller v. Toll Brothers, Inc.,no. 1:15-cv-0032. Here is a link to the complaint, courtesy of New York attorney Mark Jaffe. Plaintiff, as part of the 303 Collective, painted in 2009 a90-foot “elephant mural” on a warehouse located at Water Street in DUMBO. The owner of the wall had given the artists permission to paint it. The work was a striking piece, featuring lush vegetation, angels, and wild animals, including elephants, over a vivid orange background. As explained on his web site, CAM is inspired by the Hindu God Ganesh, who is represented as having the head of an elephant. The elephant mural was painted over in 2009, and the warehouse itself was eventually torn down for make way to, surprise, surprise, a luxury apartment development. Plaintiff claims that Defendant used in 2012, without his permission, a photograph of the elephant mural in advertisements for its 205 Water Street in Brooklyn luxury condominium development. At the time, the mural had not yet been destroyed, and had, according to the complaint, “served as the backdrop for countless videos, weddings, engagements, fashion shoots, television and print advertisements” (p.2). Defendant’s advertisements were posted in the New York City subways, telephone booths and bus shelters, and also in the print and the online version of The New York Times. The complaint states that Plaintiff contacted Defendant after learning about the advertisement and that they engaged in negotiations over possible compensation for this unauthorized use. However, while “Plaintiff produced work for [Defendant] for a number of months,… no projects ever materialized and no payment was ever made to Plaintiff for the infringing use of the [elephant mural]”(p. 4). Plaintiff has registered the copyright for the mural, and he is claiming infringement of his exclusive rights. He is seeking either actual or statutory damages, as provided by §504 of the Copyright Act, attorney’s fees, as provided by §505 of the Copyright Act, and injunctive relief, under §502 of the Copyright Act, asking the Court to order Defendant to destroy all copies of the allegedly infringing advertisement. There have been several similar cases lately, where graffiti artists sued a company for infringement of their copyright (see here, here and here). It will be interesting to see when this trend will die down, signaling that corporate counsels are finally aware that street art is, well, art, and as such, original enough to be fully protected by U.S. copyright. Image is courtesy of Flickr user dumbonyc under a CC BY-SA2.0 license.